While investing directly in timberlands requires high starting capital, retail investors can choose from other vehicles which provide exposure to timber and forest products such as REITs, related C-Corporations or ETFs (exchange traded funds). The suitability of these vehicles depend on the capital, liquidity and cash flow requirements, as well as the tax situation, of the investor. 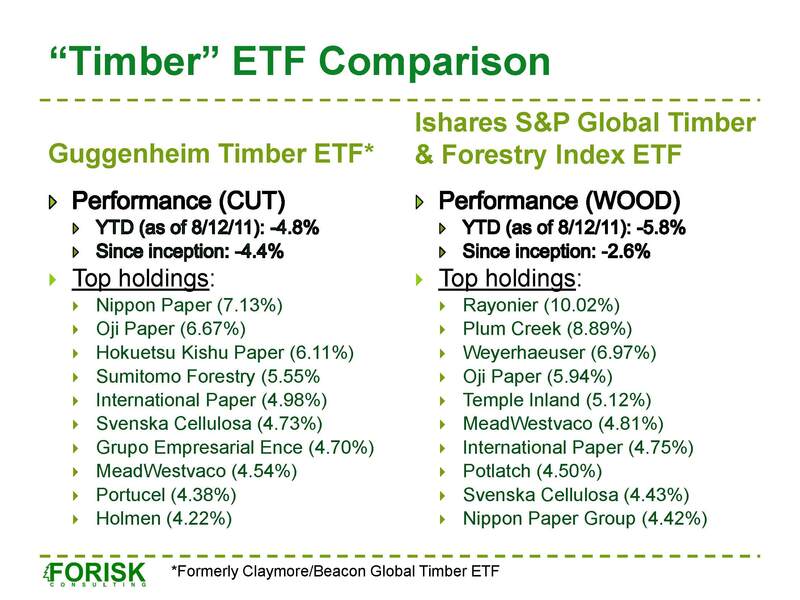 Currently, there are two primary ETFs related to timber: Guggenheim Timber Index ETF (CUT, launched in November 2007) and iShares S&P Global Timber and Forestry Index (WOOD, launched in June 2008). CUT tracks the performance (before Fund’s fees and expenses) of the Beacon Global Timber Index. The Index is designed to track the performance of common stocks of global timber companies. All stocks in the Index are selected from the universe of global timber companies that own or lease timberland and harvest that timber for commercial use and/or sale of lumber, pulp, paper, packaging, and other forest products. The fund currently has 27 securities and a weighted average market capitalization of $3.2 billion. The exposure to U.S. companies is 31.36% currently (as of September 30, 2010). WOOD tracks the performance (before Fund’s fees and expenses) of the S&P Global Timber and Forestry Index. The Index is comprised of 25 global publicly traded companies that own, manage, or are involved in the “upstream supply chain” of forests and timberlands. The Index constituents may be forest products companies, timber REITs, paper or packaging products companies, or agricultural product companies. As of September 30, 2010, the exposure to domestic companies is 46.42%. The table below shows the comparative YTD (as of close of November 3, 2010), since 2009 and since 2008 performances of the ETFs versus the FTR Index (Forisk Timber REIT Index, market weighted Index of the three publicly traded timber REITs) and the S&P 500. Please note: these ETFs do not provide a good proxy for investing directly in timber. In addition to tracking firms that own timberlands, they maintain a substantial exposure to manufacturing companies. Compared with CUT, WOOD has a greater weighting towards domestic producers and contains more pure-play timber names. The difference in the performances as seen in the table stem from differences in exposure to markets (global versus domestic) and sectors. What are the evolving risk and return characteristics of timberland investments? How do we evaluate marginal, forestry investment decisions as new technologies (such as high performing seedlings) and new markets (such as wood bioenergy) evolve? How do various timberland investment vehicles – from timberlands to timber REITs to forest industry ETFs – affect overall investment portfolios? An article just published in the New York Times by Tim Gray highlights the continued uncertainties and embedded opportunities in studying these questions (“Seeing the Forest for Its Hedges” in the July 11, 2010 print edition). And yet this article also advances, without challenge, questionable arguments. For example, timberlands may or may not hedge inflation (click here for a summary of the research on this topic). In addition, the quote from timber-bull Jeremy Grantham fails to distinguish between investing in timber versus timberlands. Timberlands – not timber – have shown a record of rising prices. The realities of and expertise required to own and manage timberland assets sit apart from the liquidity of publicly-traded vehicles. The finance of timberland investments continues to teach us how alternate timber-related investments – while anchored to a common asset – provide distinct and self-defined investment performance. On the evening of August 4th, 2010, Neena Mishra, our Director of Equity Research, and I will teach a Master Class on “Valuing Timber REITs.” This follows our day-long course on “Applied Forest Finance”, which is co-taught by our Forest Economist, Dr. Tim Sydor. Why teach these classes? Demand for and interest in timber-related investment vehicles: timberlands, timber REITs and forest industry ETFs. Publicly-traded timberland-owning real estate investment trusts, as measured by the Forisk Timber REIT (FTR, “footer”) Index, continue to outperform the S&P 500 (see table below). The FTR Index includes Plum Creek (PCL), Rayonier (RYN) and Potlatch (PCH). Weyerhaeuser (WY) will join the Index once, if expected, it completes its REIT conversion later this calendar year. Why the strong interest? Once we cut through the traditional arguments for timberlands – strong long-term risk-adjusted returns, effective portfolio diversification, potential/possible inflation hedge – timber-related investments provide simple, stable business models. Timberlands and timber REITs generate cash and appreciation through maximizing the value of hard assets through the business cycle. Please join us August 4th to learn more and participate in a hands-on session.